In September of 2016 we released the first cask of our highly anticipated limited reserve, barrel-aged, dark whiskey, Brutality™. At MurLarkey, we like to say that Brutality is a spirit that is greater than the simple sum of its parts. Every cask of Brutality is going to differ slightly from the last. This intentional deviation in taste is how we capture the spirit of the spirit. 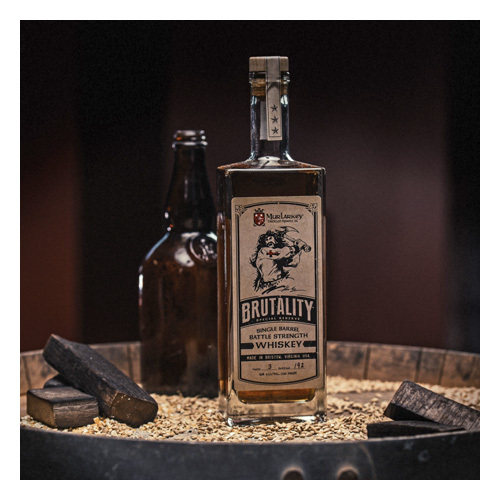 Due to its limited release, we restrict all sales of Brutality to our on-site store at the distillery. During the next cask release, be sure you visit the distillery to try this fiercely popular spirit. Because when the batch is gone, the wait for the next one could be brutal. 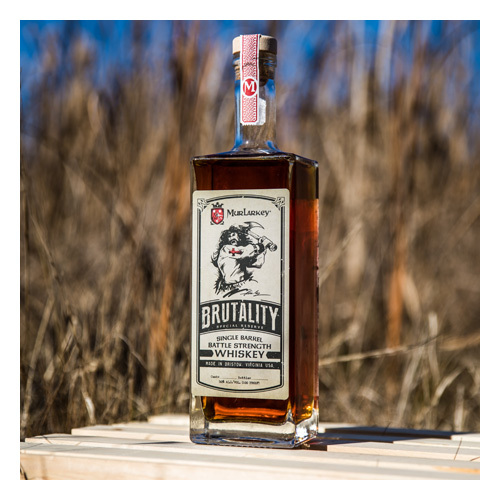 Due to its limited release, we restricted all sales of Brutality to our on-site store at the distillery. This approach allowed us to gauge market response and gain feedback that could be applied to the next batches of Brutality and future MurLarkey products. We were blown away by the response. All 220 bottles, which were sold individually with no case sales permitted, sold out in a mere 3 weeks. Following this successful launch, we immediately turned our attention to the next batch. The second cask is scheduled for release in November with a third cask coming in December. Each cask is the result of MurLarkey Product Master George “Papi” Zwetkow’s passion for aged spirits and culinary delights. Known in the industry as a “nose,” Papi’s genius extends beyond our distillery. He’s not only an expert in aged spirits, but also a bonafide 5-star chef. When it came to developing an aged whiskey, Papi approached it as he does with most of his masterpieces—thinking outside of the box, or in this case the barrel. Instead of adding the raw spirit to traditional charred oak barrels and hoping it would be good after years of waiting, Papi applied his expertise to create a different approach—using oak merlot wine barrels and varying grades of charred oak. With this unique approach, it’s guaranteed that each rendition of Brutality is a gourmet experience for whiskey aficionados. The process starts with 56 gallons of our award winning Justice™ White Whiskey, distilled by our Head Distiller Jesse Puckett to 140 proof. Papi then applies his own proprietary “flash aging” technique to the raw spirit. Over a period of several months, Papi tweaks the spirit as it ages, changing the char and the oak staves as he sees fit, masterfully controlling the aging and profile throughout the process. The result? A one-of-a-kind aged whiskey that offers the taste and profile of a whiskey years, maybe even decades older. 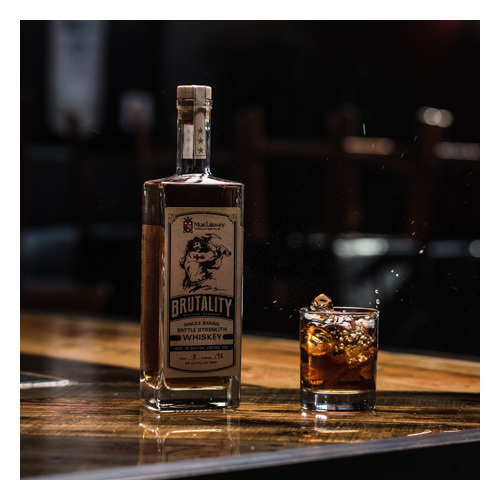 Each cask of Brutality will offer its own complex nose, long legs, smooth finish and aromatic hints of vanilla, cocoa, smoky oak, cinnamon and even clove—all naturally derived from the secret recipe of varying chars and woods. The name “Brutality” actually originated from a joke. In the process of making the whiskey, MurLarkey Co-founder and President Mike Larkin decided to sample Cask 1. After being impressed by the spirit’s legs on the side of the glass, he readied himself to sample the spirit’s nose. Just before taking a taste, at the full 120 proof, he proclaimed, “This could be brutal.” The team laughed hysterically as Mike closed his eyes and took a sip. Much to his delight the spirit was smooth and delicious, but the laugh remained and the name Brutality was born. This name was not an immediate hit among those outside the MurLarkey team. In fact, many of our insiders found it to be negative. “Who will ever purchase a spirit called Brutality?” many questioned. It was not until the original artwork of the Celtic warrior, drawn by local artist and friend Kevin Bednar, was finally seen that most fears began to subside. When designing the full label set, MurLarkey Co-Founder and CEO Tom Murray had the idea to replace the traditional “Barrel Strength” mark indicating a high proof spirit with “Battle Strength.” The play on words gives the bottle a welcome edginess.